I’ve never really liked cake. I’m just going to put that out there. I know that’s blasphemous to the chocolate sweet tooth fiends out there, but hey, I just like meat more than the cake. Personally, I view this as a positive thing as if I added cake to the long list of unhealthy things I excessively eat, I would be the size of an eight bedroom house. For my birthday, I’ve always had cake alternatives. Mostly, if I had a birthday cake, it was for the sake of my birthday party guests (how selfish of them). The only kind of birthday cake I’d really entertain the thought of was strawberry shortcake (because it has more strawberries and whipped cream than actual cake), or ice cream cake but only if it had those excellent little crunchies in it. I don’t actually know what they’re called, I just call them crunchies. 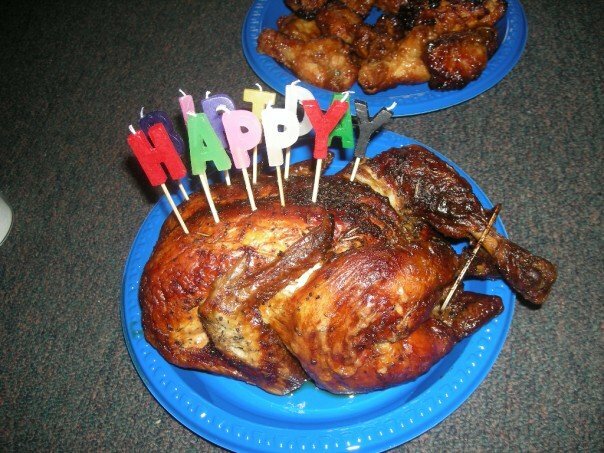 This is the result of thinking ‘outside the box’ – birthday cake can come in all different forms, even that of a plump chicken. What is the point of this useless information? Well, the point is, I generally don’t like cake… but I have found a form of cake that I do like. 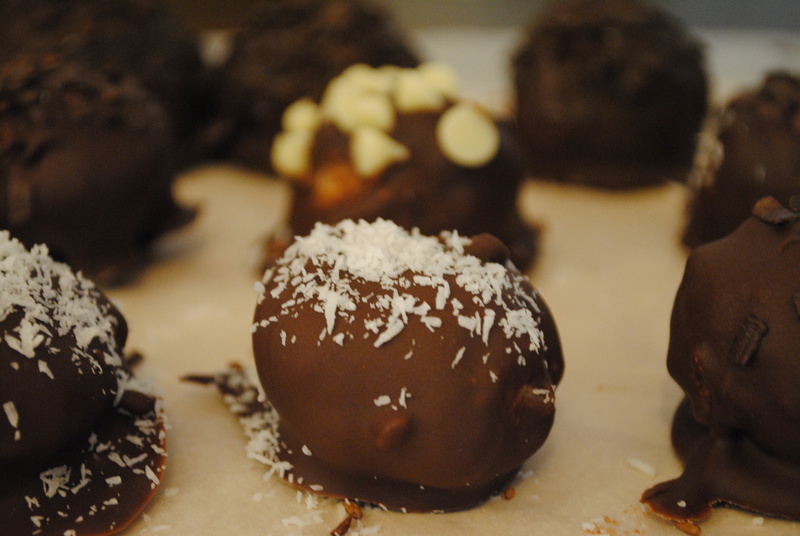 This is thanks to my lovely friend Casey Cave and her amazing recipe for cake balls. 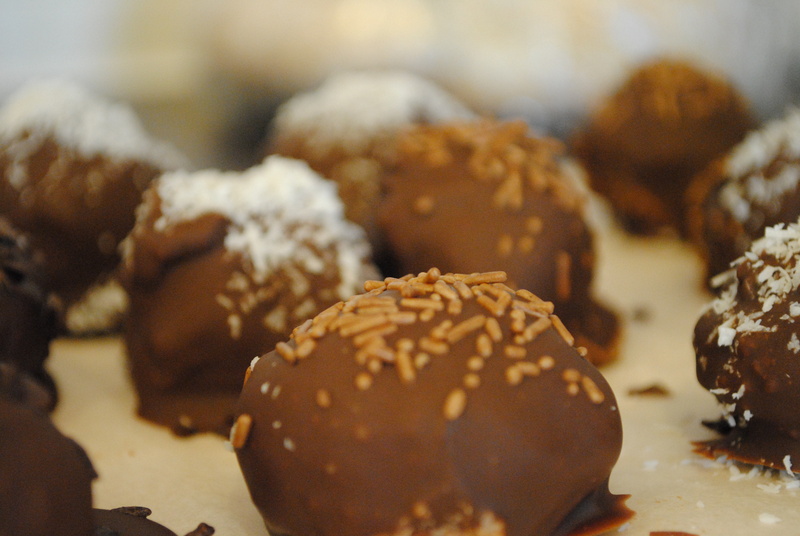 Much like a cupcake, cake balls allow us to experience cake in its myriad of forms. These are incredibly easy to make but very tedious! 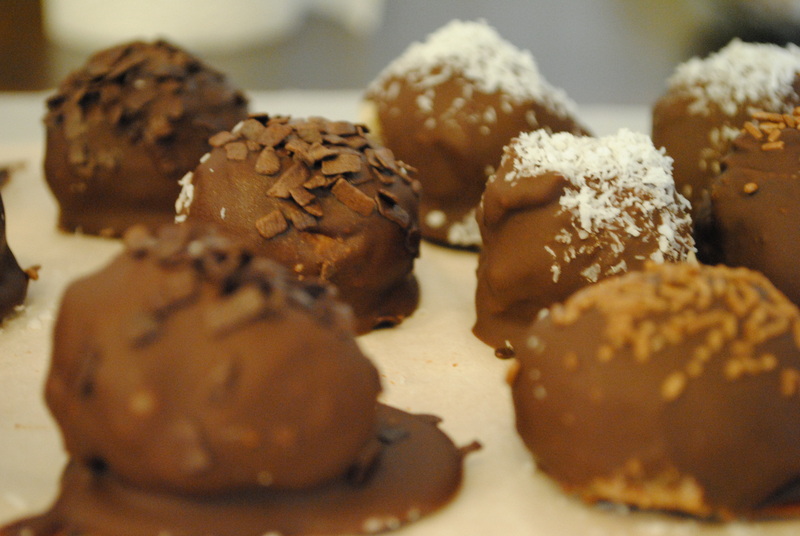 Advice: make these on a day you are sitting home in your pajamas and don’t plan on joining the outside world. 1) Bake the cake according to the directions on the back of the box (for a 13×9 cake). 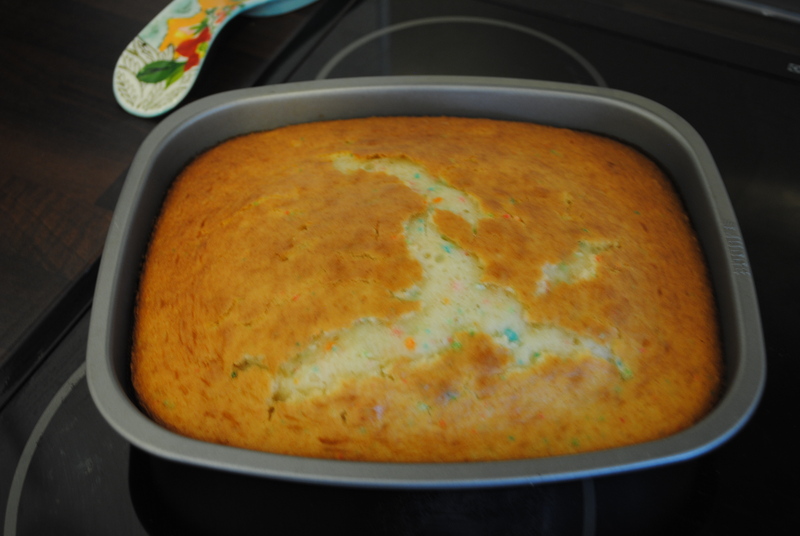 Allow the cake to cool. 2) Once the cake has cooled, crumble the cake into a bow. 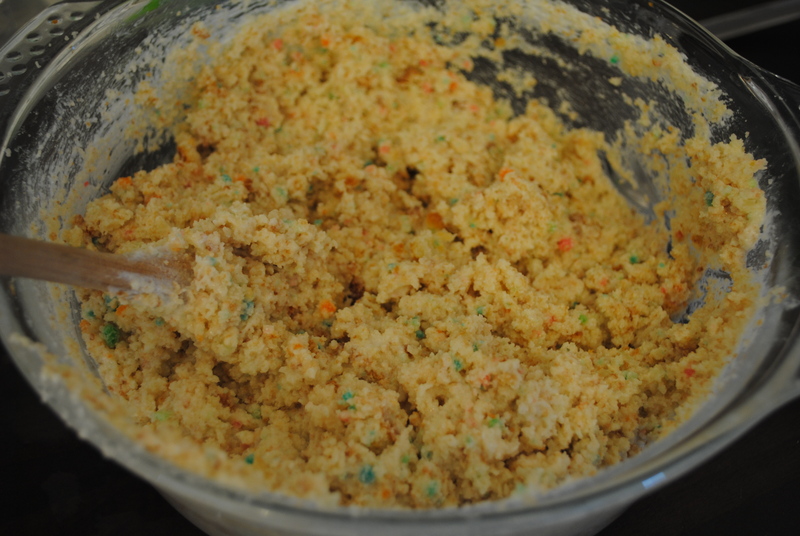 Mix the entire tub of frosting with the crumbled cake- mix until the mixture is uniform and completely combined. 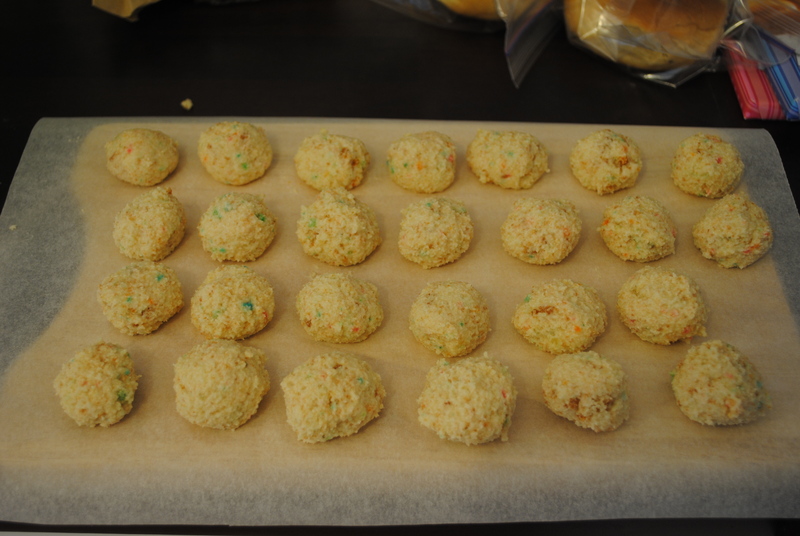 3) Roll the mixture into balls and place the balls on wax paper (preferably wax paper that has been placed on a cookie sheet). 4) Freeze the balls for several hours. 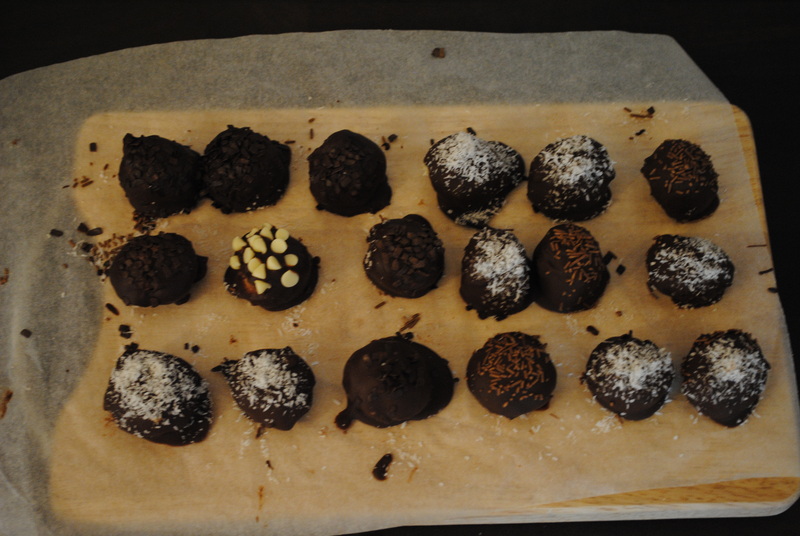 5) Once the balls are fully frozen, melt the chocolate in the microwave or in a pot on the stove and dip the balls into the chocolate. 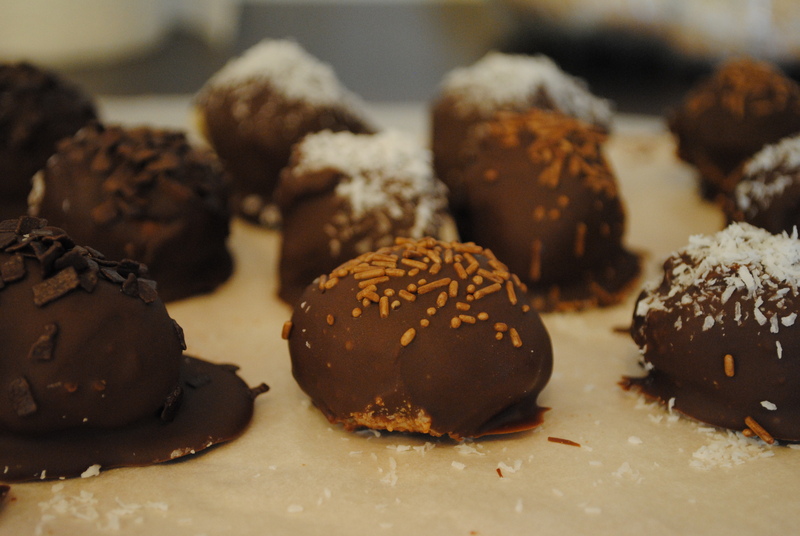 6) Lay the chocolate covered balls on the wax paper and sprinkle the balls with sprinkles, if desired. 7) Refrigerate the balls until served. 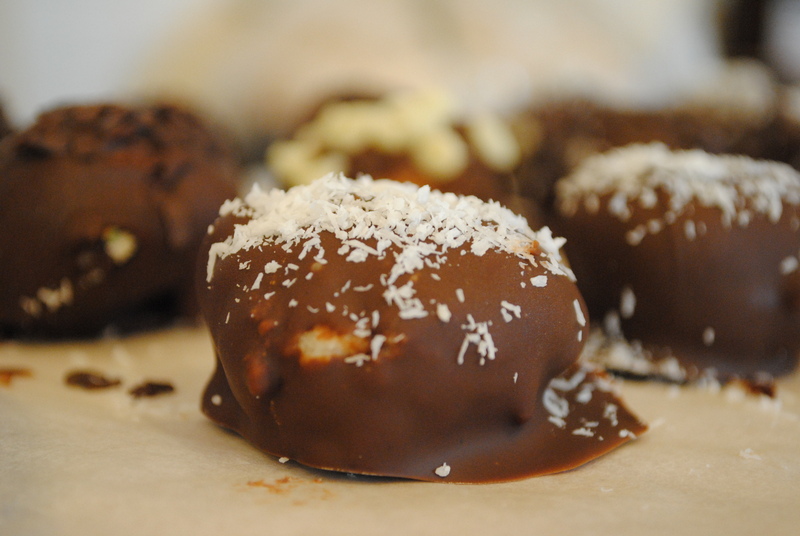 The beauty of these if you can pretty much sprinkle whatever you want onto the balls after you’ve dipped them in the chocolate. 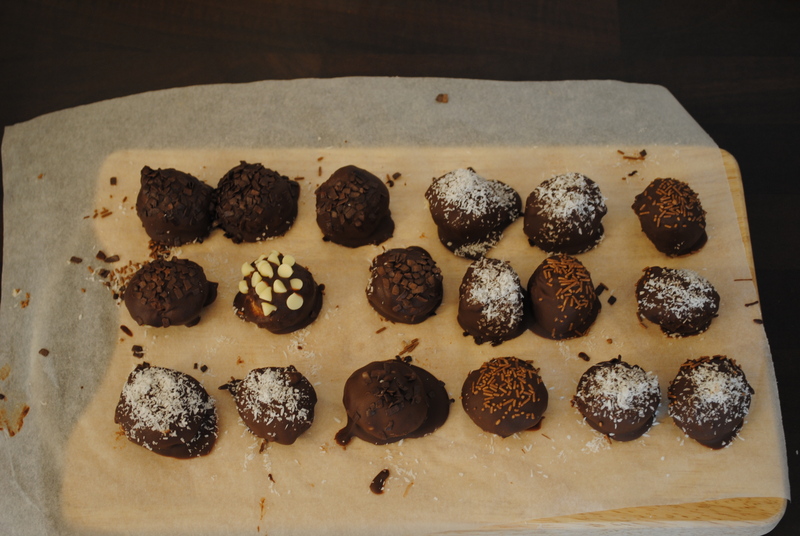 I chose to put coconut, chocolate sprinkles, dark chocolate shavings, and one crazy one with white chocolate chips which turned out to be a little too much for me to handle. 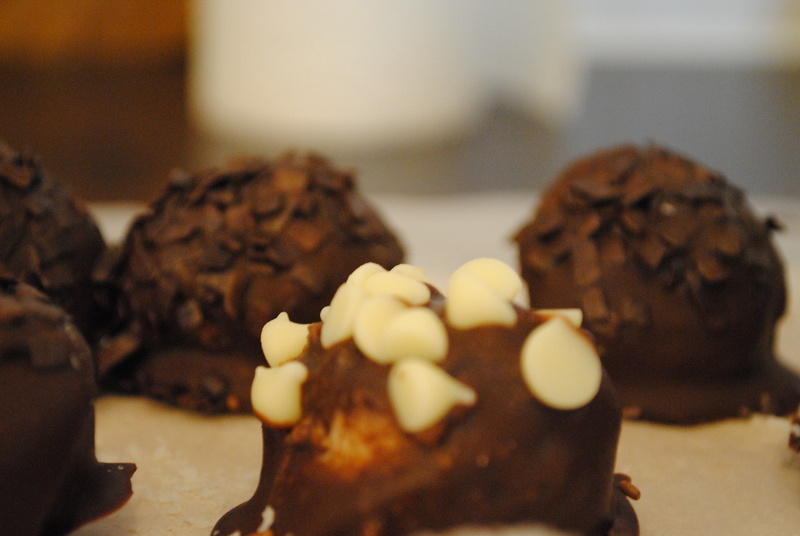 For a list of all the best cake and icing combos to use when making cake balls, visit Casey’s blog, The Confectionary Cave! Posted in Home CookingTagged Home CookingBookmark the permalink. 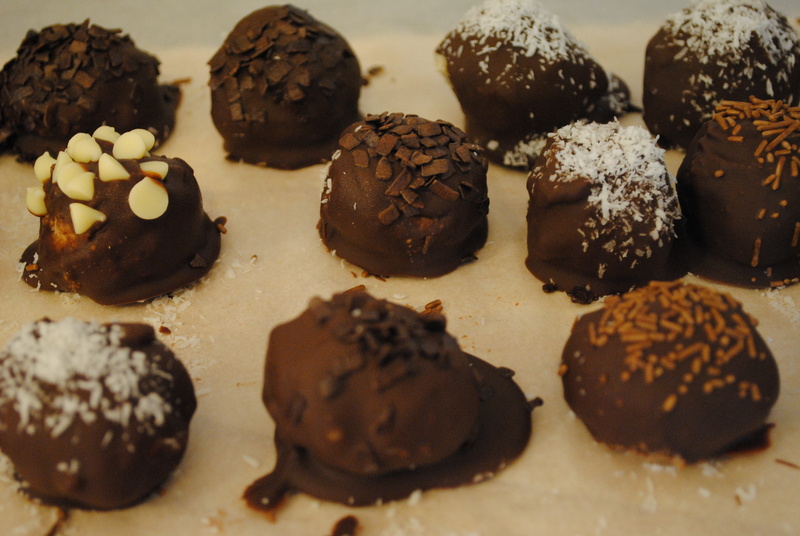 Those cake balls look delicious! Too much work and too much planning ahead for me though.